We are Frijoles Locos and are here to do our very best to ensure your vacation in Playa Grande is everything you want it to be, and more. The Frijoles Locos team wishes to share with you our love of the ocean and our passion for the ocean lifestyle. To achieve our goals, we are fortunate to have the most amazing team at Frijoles Locos. Walking into the shop, you will most likely first encounter Eli, our soft spoken, intelligent, and no-nonsense kind of guy. His pleasant demeanor and genuine nature are infectious and he always aims to please. Eli loves to get his hands dirty and problem solve for the shop and for our customers – he gets the job done and gets it done well. Have a question about surfing or Costa Rican wild life? Eli has the answer! We are grateful that he joined our team in 2017. Eli has two beautiful daughters Mia & Amber at La Paz Community School who share their dad’s love for surfing and music. If Eli is not in the shop you can likely find him surfing his longboard, out teaching surfing lessons or spending time with Mia & Amber. Juan Carlos is our jack of all trades- JC is like WD-40 – he makes everything run smoothly. Constantly looking for things to do, JC tidies, organizes, categorizes and maintains our rental equipment and anything else he sees fit. JC is a patient, talented surf instructor and enjoys sharing his passion for surf with budding surf lesson clients. JC really loves to cook, and is very good at it. If you are looking for a casual cooking experience at your rental home, let us know and we can line up JC for you on his days off. Andrea is JC’s sister and joined our team in 2017. When you walk into the shop, you will feel her bright and bubbly personality right away. Not only does she have a cool sense of fashion, she also loves to help pick out the perfect piece of merchandise for you! Her positive and friendly attitude towards everyone allows her to bond with customers and guests alike and make you feel comfortable. Having a brother who is very passionate about surfing and working at a surf shop naturally lead to Andy embracing the surf culture herself. Don’t be surprised to find her along with her colleagues out in the line up! Azucena keeps everything neat, tidy and clean. A fantastic organizer, Azu makes our back-stock bearable and our shelves clean and visually appealing. Primarily fulfilling the role of cleaning lady for the shop and apartments, Azu goes above and beyond, learning some simple merchandising tricks, to present our retail store in the best way possible. JJ joined the Frijoles Locos staff team around April 2013. A passion for surf, he can talk to you forever about boards, surf spots, waves, anything that interests you about surfing! Moreover, JJ has a passion for his country, the wildlife, the birdlife, the trees and he loves to impart his knowledge on any willing ears. Having a degree in journalism, and a knack for graphic design, you will see the fruits of JJ’s work in our printed promotional materials. JJ is our Head Surf Instructor and eager to share his passion for surfing with you. An encounter with JJ in Frijoles Locos will surely make you smile, and leave you feeling like you learned something new! Jeannette has a zest for life and a surfer’s addiction like no other German yet! 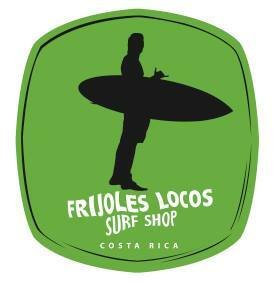 Starting at Frijoles Locos as our surf lesson client, Jeannette caught the bug for surfing and hasn’t looked back. Now firmly entrenched in the addicting world of surfing, Jeannette has found a way to balance work and fun. She now puts her university education to work (Tourism and Hospitality), creating the ideal vacation for you in her role as Concierge Manager. You are most likely to encounter Jeannette first online, when you inquire about tours, activities, transport, surf lessons or similar. She is also our Guest Liaison and will be your first port of call for any issues that arise as a guest in one of our lovely apartments. Besides being there for guests, clients and customers, Jeannette is an invaluable help to our management. Carla is the newest member of the Frijoles Locos family. She joined the team in April 2019. With a background in hospitality, she knows how to make you feel right at home as soon as you walk in. Let her know what you need and Carla will go above and beyond to assist you. Jostin grew up surfing at a young age and loves to spread the surf stoke. As an instructor he will definitely get you up on the surfboard and make sure you get the most out of your surf lesson! Jostin happily assists you in all things surf and loves sharing his knowledge about surfboards, surf spots and recommending other beautiful places to explore in his home country of Costa Rica. Jules is a tica with an American dad and dual US citizenship. Jules grew up in San José, and went to school for Tropical Biology here in Costa Rica. She specialized doing sea turtle research and worked later with the World Wildlife Fund in Playas Ostional, Nancite and Junquillal in Guanacaste. She got a Masters in Environmental Management at Yale’s School of Forestry & Environmental Studies and has worked on climate change issues at the intersection of environment and development for over a decade. She’s done field work with marginalized communities in Asia, Africa, Latin America and Europe and tried the private sector while working for a startup in San Francisco. After globetrotting and living in a couple of US cities (Washington DC and San Francisco), she decided there’s no place like home. Jules is a champion for the environment and for local communities, her younger brother surfs and she grew up going to Guanacaste with her family. She’s most at home floating in the tropical Pacific, hiking in the Costa Rican rainforest or listening to the congos on a rainy afternoon— needless to say, she’s thrilled to support the small, tight team here at Frijoles Locos while getting to enjoy the turtles, the salt air and her beloved Ceibos. Drew & Jules met in Drew’s NC surf shop in 2012 when she came in with her brother to rent a surfboard. Jules was living in Washington, DC but they kept in touch, started dating and quickly realized they wanted to be together. They married in January of 2014, traveled and volunteered around Southeast Asia for 6 months and moved to California in May of 2014. They were living in the San Francisco Bay Area when Drew discovered the Frijoles Locos sale listing — after nearly a year of research, hundreds of emails, countless Skype calls with Corynne and a few visits to see the shop and business in action, they had committed to their dream of living in Guanacaste and moved to Playa Grande to take over Frijoles Locos. They know that Corynne and Ian are leaving big shoes to fill but are confident in their past experience, the amazing Frijoles Locos team, the wonderful Playa Grande community and the ongoing support of Corynne and Ian. Frijoles Locos Surf Shop is proud to support La Paz Community School, particularly their scholarship program so that today’s youth will have a bright future. In generations to come, local families will have more opportunity to create their own businesses, become leaders within the community, increase awareness of our environment and embrace sustainability. La Paz Community School is a non-profit organization that was founded in 2007 in order to address fundamental socioeconomic and cultural gaps prevalent in a region struggling to cope with the balance of an agriculture and tourism based economy. By integrating talented youth from the underprivileged, middle class, and upper class sector of rural Latin America, the school transforms student differences into strengths that foment rich and meaningful dialogue and experiences at all grade levels, thus preparing students to effectively confront global challenges. The scholarship program at La Paz Community School enables students who would never have been afforded the chance to receive such a quality education, to do so. While donations to the scholarship fund help cover costs of education, there are so many other needs to be met, which is where you can really help (Pack for a Purpose). Thank you for your time and effort in giving back to the community you are visiting. In this way, you are truly helping to change the future of these wonderful children and consequently, their own families. Frijoles Locos also supports CEPIA, founded by the wonderful, talented and visionary Laeticia DeWeer. CEPIA is an organization that helps improve the quality of life of youth and families in the local area, by supporting and training to assist the poor in job placement, teaching new skills, attending to physical and mental health of those in need, and promoting cultural development.